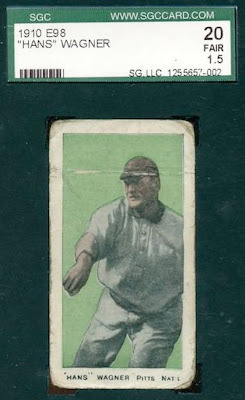 Thanks to Heritage Auctions' massive hyping of an "attic discovery" (a.k.a., The Black Swamp Find) and upcoming sale, a bunch of readers found my own post profiling the 1910 E98 #5, "Hans" (Honus) Wagner. Value speculations like the unlikely $3 million figure in this Ohio find benefit from association with the similar and far more popular T206 set, whose Wagner card set the ceiling for single-card pricing many years ago. Across the board, tobacco issues like the T206 outpace candy sets like E98, simply because collectors want them more and desire drives prices up. Keith Olbermann applied his collector experience to the question of what adding a large quantity of low-demand cards means to the E98 market. His answer: nothing good. The best part about the Black Swamp story is that it happened at all. Paper cards are meant to vanish like leaves as time progresses, otherwise collectors wouldn't treasure this glimpse into the past. Hopefully everyone will make some money off the auction and come away happy. I just don't expect my beat up Wagner to benefit in a meaningful way. If anything, he'll sell for even less next time around!